Is segregation in the United States improving? And if it is, what race sees the most people of different races? And do the answers to these questions change based on the time of day? Vox sets out to answer some of these questions through a video essay and an interactive map about segregation in the United States cities at work and at home. This map shows the population density of Black people living in Champaign-Urbana, IL. 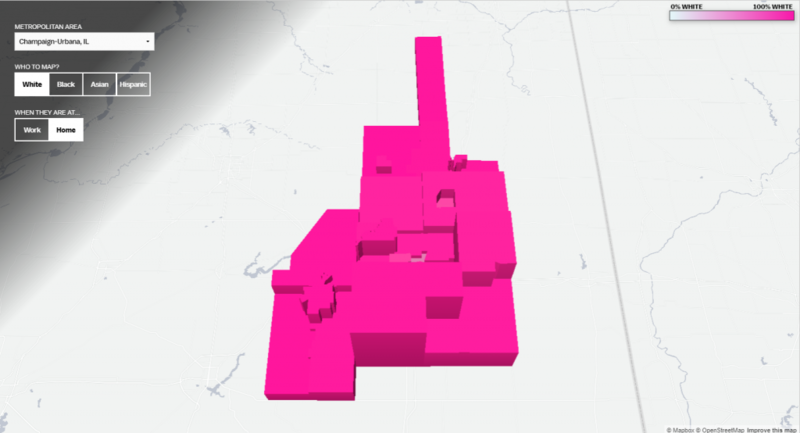 The brighter the pink, the higher the percentage of Black people living only near Black people. 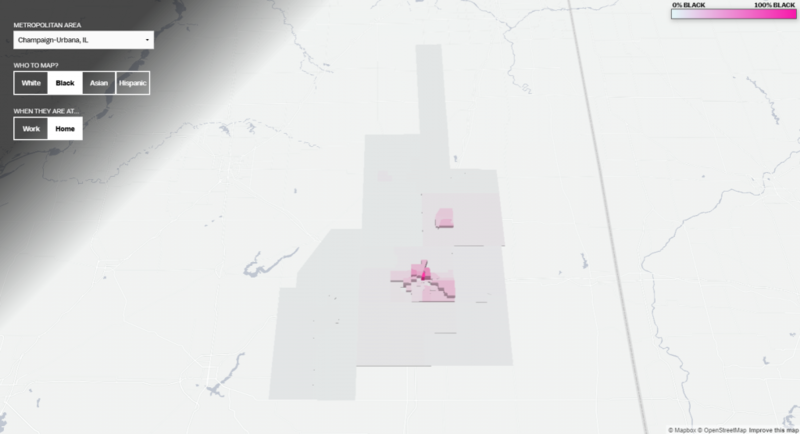 This map shows the population density of white people living in Champaign-Urbana, IL. The brighter the pink, the higher the percentage of white people living only near white people. The map is interesting and effectively demonstrates the continued presence of segregation in communities across the United States. However, there is little detail on the map about the geographical features of the region being examined. This isn’t too much of a problem if you are familiar with the region you are looking at, but for more unfamiliar communities it leads to more questions than it answers. After 15 years on Mars, the Opportunity Rover Mission was officially declared finished on February 13th, 2019. 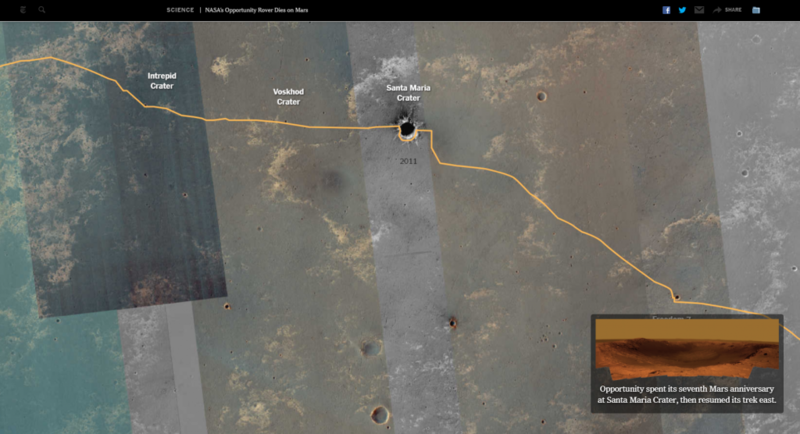 The New York Times created a visualization that lets you follow Opportunity’s 28 mile path across the surface of Mars, which includes a bird’s eye view of Oppy’s path as well as images sent by the rover back to NASA. Opportunity was responsible for discovering evidence of drinkable water on Mars. The map of Opportunity’s path is accompanied by images from the rover and artists’ renderings of the surface of Mars. 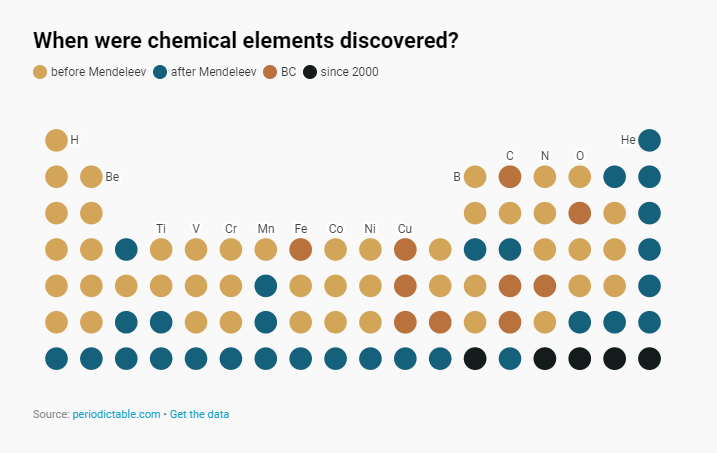 The periodic table: a data visualization familiar to anyone who has ever set foot in a grade school science classroom. As Lisa Rost points out, the periodic table is actually just a simple scatter plot, with group as the x-axis and period as the y-axis. Or at least, that’s true of the Mendeleev periodic table, the one we are most familiar with. See some other examples of how to break down the periodic table on Rost’s post, which links to the Wikipedia article on alternative periodic tables. If you find a favorite, be sure to tweet it to us @ScholCommons! We are always curious to see what visualizations get people excited. A periodic table color coded by Lisa Rost to show when in time different elements where discovered. This entry was posted in Data Services, Data Visualization and tagged Data Vis, Data Visualization, exploring data visualization by Xena Becker. Bookmark the permalink.